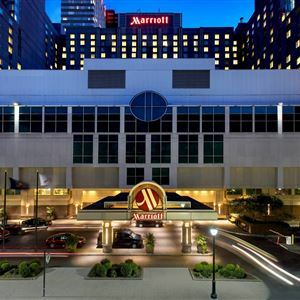 Property Location With a stay at Philadelphia Marriott Downtown, you'll be centrally located in Philadelphia, steps from Lowes Philadelphia and Free Library of Philadelphia. This 4-star hotel is close to Liberty Bell Center and Independence Hall. Rooms Make yourself at home in one of the air-conditioned rooms featuring refrigerators and LCD televisions. Cable programming and video-game consoles are provided for your entertainment, with wired and wireless Internet access available for a surcharge. Private bathrooms with shower/tub combinations feature complimentary toiletries and hair dryers. Conveniences include phones, as well as safes and desks. Amenities Be sure to enjoy recreational amenities including an indoor pool and a fitness center. Additional amenities at this hotel include complimentary wireless Internet access, concierge services, and gift shops/newsstands. Dining Enjoy a meal at one of the hotel's dining establishments, which include 2 restaurants and a coffee shop/café. From your room, you can also access room service (during limited hours). Quench your thirst with your favorite drink at a bar/lounge. Business, Other Amenities Featured amenities include a business center, express check-in, and express check-out. Planning an event in Philadelphia? This hotel has 92223 square feet (8568 square meters) of space consisting of conference space and meeting rooms. 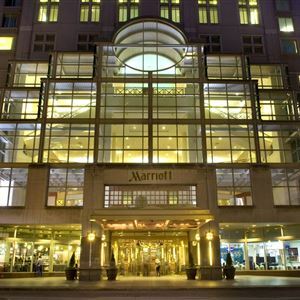 With a stay at Philadelphia Marriott Downtown, you'll be centrally located in Philadelphia, steps from Lowes Philadelphia and Free Library of Philadelphia. This 4-star hotel is close to Liberty Bell Center and Independence Hall. Make yourself at home in one of the air-conditioned rooms featuring refrigerators and LCD televisions. Cable programming and video-game consoles are provided for your entertainment, with wired and wireless Internet access available for a surcharge. Private bathrooms with shower/tub combinations feature complimentary toiletries and hair dryers. Conveniences include phones, as well as safes and desks. Be sure to enjoy recreational amenities including an indoor pool and a fitness center. Additional amenities at this hotel include complimentary wireless Internet access, concierge services, and gift shops/newsstands. Enjoy a meal at one of the hotel's dining establishments, which include 2 restaurants and a coffee shop/café. From your room, you can also access room service (during limited hours). Quench your thirst with your favorite drink at a bar/lounge. Featured amenities include a business center, express check-in, and express check-out. Planning an event in Philadelphia? This hotel has 92223 square feet (8568 square meters) of space consisting of conference space and meeting rooms.